Speaking as perhaps one of the last teenagers in America to get an Instant Messaging account, I can’t speak very knowledgeably about the history of online chatting. There have been dozens of books written on the subject: I’ve read not a one. This is not a research paper. It would be cruel for me to write one during the summer, anyhow. These are just some observations. or “taste the stale air of ur destruction,” which I roughly translate as, “I have too much time on my hands and need more geography homework.” But beyond the complete misuse of English and Roman numerals, there is a complex subculture of, you know, other stuff. Most IM services, including iChat AV, come with a set of canned ‘away messages,’ little epitaphs of online death that announce to everyone on your buddy list what you are doing instead of talking to them at that moment. The standard roster of away messages (the ones most often offered by IM services) include, “I am away from my computer right now,” “I am not available because I am playing a computer game that takes up the whole screen,” “Eating,” “Sleeping,” and other such trivialities. iChat AV merely offers, “Away,” which is not too original but does get to the heart of the matter: away messages were originally intended to be more informative than answering machines while serving the same basic function. If you hover the pointer over your buddy list in iChat, the away message will briefly appear on the screen. In addition to the standard fare, users are given the option of creating customized away messages, either for one-time use or to be saved in a catalogue for frequent display. (iChat AV lets you make customized available messages, but that’s just because it’s made by Apple and they think of things like that.) There are even Web sites devoted to sharing and suggesting away messages, though users have to judge for themselves how clever, “College: Producing alcoholics since 1892” really is. But… give a kid a school uniform, and they will find the surest way to be decidedly irregular. Away messages have become vehicles for personal, social, religious, and political expression, not just your run of the mill “gone for apples” note on the fridge. Young adults are willing, if not eager, to share their views on pretty much any topic in their away messages – blogs (Web diaries) in miniature. What with last year’s elections, the instillation of a new Pope, shocking developments in the sports world, an ongoing war fought mainly by people in the 18-25 age range, and the normal trials and tribulations of living, away messages have been fascinating. Educational. Informative. You can tell a lot from an away message. The running man says the user has an AOL Instant Message account and hasn’t bothered to customize it. These two messages are standard, canned messages for AOL IM. It isn’t always that intriguing, though. Quotes are common, song lyrics popular, birthday announcements customary, and there might possibly be someone online who actually uses their away message to tell you where they are. These, however, are considered to be poor efforts. Unlike with answering machines, it is literally expected that people respond to your away messages: it is cause for offense if no one responds to your brief, shrewd, and witty commentary on life. People (who I will obviously not quote) will go so far as to write sexist, racist, or otherwise insulting things to goad replies out of their friends; such messages are just illustrative of the high importance placed on real-time feedback and reassurance that people care what you have to say enough to constantly check your away message throughout the day. I’m off saving the world. Please leave your tribute and other offerings at the altar. 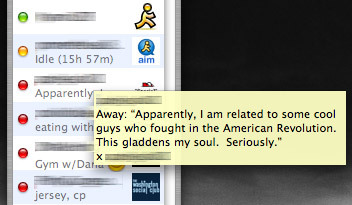 Apparently, I am related to some cool guys who fought in the American Revolution. This gladdens my soul. Seriously. i put a big poster map of the US on the wall in the common room, but i'm taking it down because noone (especially Friend1, who i'm living with) thinks it's cool except for me. why does noone else think maps are sweet? i think most people secretly like to look at maps, but they won't admit it. well for any of you future visitors i have a sweet map of the US, but it'll be rolled up in my closet. you know, if you wanna look at it. in my closet. if there isn’t a football game, and I mean soon, I’m going to have to tailgate at a swim meet. that’s just dumb. The trombone is a harsh mistress. I have to go, the rice is burning. Before I graduate, I am going to invent a giant trebuchet to fling me to class each morning. As a citizen of New Jersey, I officially declare war on the state of Maryland. For every animal you don’t eat, I’m going to eat three. Guh. Snah. Mreah. Aroo? Heh. Training with elite Panda Forces. Nietzsche would have made a lousy husband. I’ve been practicing my dinosaur noises. Akkkkiiiiaaaaaooowwwwrrrrr! I made a face today and it wasn’t very pretty. This is why I need a digital camera. So I was discussing religion with a friend who doesn’t believe in evolution, and I asked her about the appendix in humans, and she said it was an organ saved for Ascension. Ummm, no. People with appendicitis are not going to Hell. The word ‘tragedy’ means ‘goat song’ in Greek. Custom away messages: vanity plates for the mind.